All your active property tours appear in this inventory in order of MLS number/Tour ID. 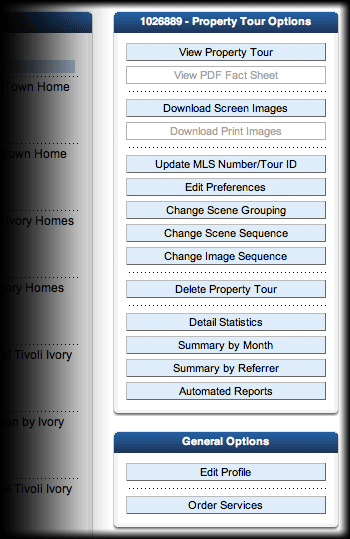 Click on the thumbnail image to activate the "Property Tour Options" pane. Show Me The Homes Property Tours have a consistent URL: www.showmethehomes.net/[mls number or tour id]. For convenience, you may also launch the tour here in the options pane. If you have ordered an optional .PDF File Fact Sheet Service for the selected property, the "View PDF Fact Sheet" button will be active. Access tour images by clicking on "Download Screen Images". You may next select specific or all of the images which download in a .zip folder. Optional print images (up to 2560x1920 pixels @ 350 ppi) may also be available for download. This option renames and re-addresses the tour. Any existing links to the prior MLS number/tour id will be broken. If you are updating a WFRMLS number to connect a tour to a new WFRMLS listing number, this function will automatically add the "tour" link to the new WFRMLS listing. This option allows you to edit the property description (appears above photo), select alternate tour skins and toggle on or off the extended tour description or download tour features. 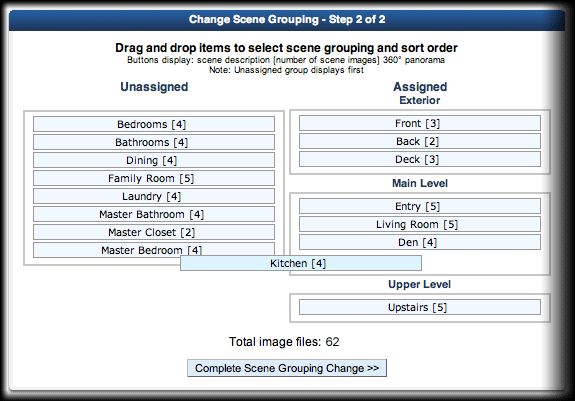 These options allow you to setup new scene groups (up to 5) and/or change the presentation sequence of the scenes any way you like using our simple drag and drop interface (pictured left). This option allows you to change the presentation sequence of the up to 5 images within a given scene. SmartShowing Tours remain online until the listing is sold or released. Tours associated with WFRMLS listings are now automatically removed from the system 30 days after the listing is reported sold or expired in the WFRMLS, and the images are automatically transmitted to the WFRMLS in compliance with the WFRMLS Photo Initiative. With monthly, full data detail and referrer reports, you can see trends and identify where Internet traffic is coming from. Set up automated email reports daily, weekly or monthly for up to 5 email addresses so you can keep your clients in the loop.